I stopped giving my students the one or two question warm ups that EVERYBODY worked on. It wasn't fair to students who were either absent or were behind or even needed a challenge. I split my class into three groups using assessment data and assigned them a group for which they complete the Do Now. Students are only required to complete that one problem and then move onto the student discussion which requires reasoning or analysis of some sort. If students finish both of those things early, which rarely happens, then they can complete the other two group problems for fluency. After roughly 8 minutes or so, I go around and track student work. During this time, students are no longer working. They are DISCUSSING their response to the discussion/student writing prompt with their group or a partner. I am listening in on student conversations as well at this point and circling their rating on the rubric. 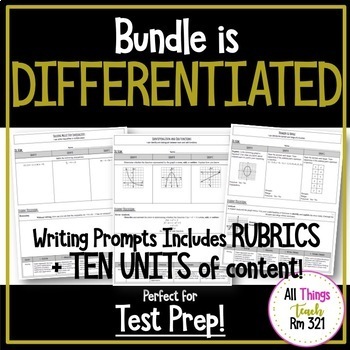 Please note--This bundle can be used for review topics in Algebra II or even NY Regents or any other Standardized Test Prep. Feedback: My principal was amazed at this implementation I created with this assignment. My main feedback from him in my observations is always differentiation, so I've worked tirelessly on coming up with ways to ensure all of my students can access the curriculum. Starting the class off in this way has been a huge first step! Try it out and let me know how it goes for you! Also, find me on Instagram to watch me teach and see how I put my resources into action! 4.1.1 Linear Functions - Linear or Nonlinear? 4.1.2 Linear Functions - Linear or Nonlinear? 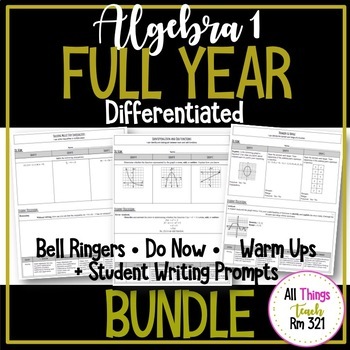 If purchased, you are agreeing that the contents are property of All Things Teach Rm 321 and licensed to you only for classroom/personal use as a single user. I retain the copyright, and reserve all rights to this product.